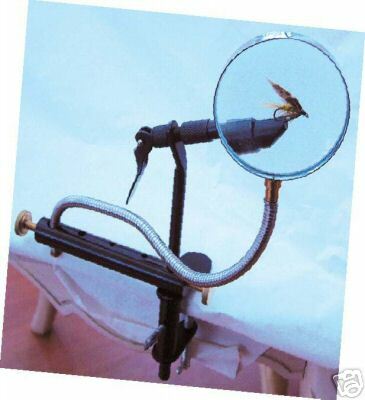 Fishing magnifiers are a real necessity for most fly fishers. You may need one you can mount on your desk for tying flies. Or maybe you need one while fishing so you can change hooks or do other close work. Either way, there are certainly times when it is handy to be able to magnify what you're looking at. If you tie your own flies, it is likely that you'll want a magnifier that sits on a table, and has clamps to hold the hook you're working on. You can find magnifiers like this for under $20 in many cases. Look for fishing magnifiers that lock into any angle, so it is easy for you to use. The magnifier will enlarge the object behind it, letting you see the details more easily. The base should be heavy enough to keep it stationary. Alligator spring clips are useful for hanging on to flies as you are tying them. If you want to spend a little more, you can get magnifiers that clamp onto your desk or table that not only have a magnifying lens, they also have a built-in light. Some have a movable neck, and others have flexible necks that offer the greatest amount of adjustment. If you need fishing magnifiers, there are several different types to choose from. 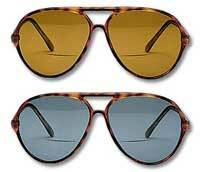 Some prefer to get polarized sunglasses with bifocals. Others prefer to add clip on magnifiers that attach to your sunglasses or regular glasses. Still others prefer fishing magnifiers that clip onto your hat brim, or that are mounted on a headband. If you don't need a large area magnified to do all the tasks you are called upon to do while angling, bifocal sunglasses may be the right answer. Some have an almost seamless bifocal on the lenses; others have a separate area beneath each lens for the magnifying lenses. Some sunglasses can be made with your own bifocal prescription as well. Prices for these types of sunglasses can range from $25 to over $200, depending on what kind you choose. Clip-on magnifiers are easy to use. Just clip them onto your existing glasses. When you don't need them, just flip them up and out of the way. When you do need them, flip them down, and they increase the magnification from one to three times, depending on the strength you choose. Prices for clip-on magnifying lenses run from $15 to $40. If you like the idea of a magnifying lens that clips onto the brim of your hat, there are several on the market that can give you 2.25X or more magnification. They are attached to a small clip and pin, which attaches to the brim of a baseball cap or fisher's hat. Just flip them down when you need to tie a tippet, and you'll be able to see it with ease. If you shop around, you may find some with stainless steel framing to make them a little stronger. Prices range from under $20 to $50. Some of the higher priced lenses may include an attached LED light to illuminate what you are working on for easier tying. For those who prefer the headband type, this is similar to what you may have seen jewelers wear. The headband fits easily on your head, and you can flip the lens frame up or down as needed. This may come in handy when tying knots in your line. If you prefer to wear a hat when fishing, this may get in the way. Prices range from $32 to $40. Choose from low powered magnification and high powered. The lens arm easily moves up and down, and the headband has padding on the front for comfort. An adjustable Velcro strap in the back helps provide the best fit.